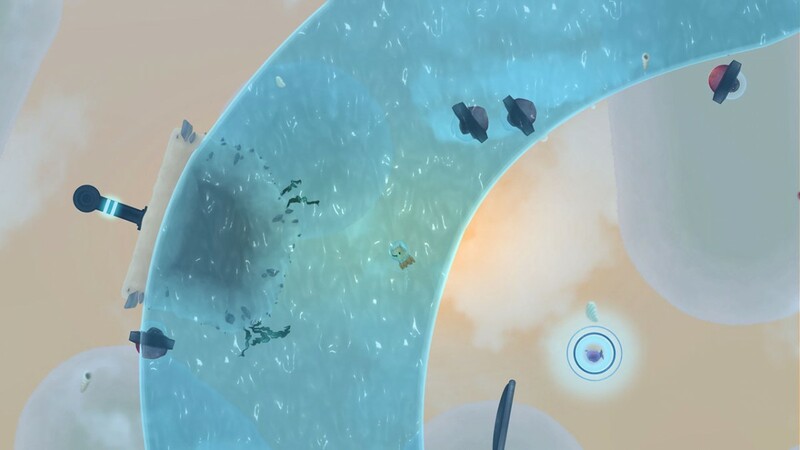 REVIEW - Airscape: The Fall Of Gravity - Use a Potion! Let’s get one thing straight before we start here – Airscape: The Fall Of Gravity is a punishing game. I’d go as far as saying it’s ‘Dark Souls’ of the physics based platforming genre. Upon completion you’re offered your stats through the game – I died 986 times. Never before has a game made me feel so inadequate. Yet, in some satanic way, this is what the four man development team behind the game intended when they crafted this brutal game. Thankfully though the dying is worth it; despite the punishment you endure you’ll find yourself enjoying the game along the way. The games opening shows you and your octopus friends going about your way peacefully in the sea when aliens strike, kidnapping you and your friends and taking you away from the peaceful oceans and to a far out place where physics and gravity aren’t quite what they seem. From there on your have to traverse bizarre terrains as you look to rescue your friends and head back down to your home in the soaring ocean. The story doesn’t get much more detailed than that, but Airscape: The Fall Of Gravity isn’t a game that focuses too much on it’s story but rather its gameplay. One thing I did appreciate though is how the opening was reminiscent of the opening from classic 16-bit sea adventure ‘Ecco The Dolphin’. I’m not sure if this was intentional or not by the developers but I appreciated it regardless. Airscape: The Fall Of Gravity has you controlling an octopus as you jump across platforms, swim through floating streams of water or even ride turbo-charged platforms as they blast you through the twists and turns of a level. Meanwhile, gravity is constantly changing – see that slightly low piece of terrain above you? One quick jump near it sees gravity shift and suddenly you’re walking along it. It’s a nice feature and the developers did a great job integrating it in a fulfilling way, the ability never feeling tacked on. Noone said navigating the levels was going to be easy though – whilst you need to take your time and be precise with each jump you make, the game manages to make it all the more difficult by throwing a ton of hazards your way; you’ll face homing missiles, lasers, robots or simply deadly falls. It’s a non-stop barrage of deadly obstacles coming at you constantly – it really is brutal. Whilst the difficulty is manageable through the first few zones by the latter half of the game some levels are so tough you’ll find yourself infuriated, hurling your controller at the wall as that laser catches you just as your approaching the end of a level. Or maybe that’s just me. Latter stages include a lot more environmental hazards too with the constantly moving platforms, gusts of wind disrupting your carefully planned jumps or the poisonous water streams where prolonged use finds your octopus meeting his demise. Your octopus will meet his grisly end plenty of times. The difficulty is fair though – none of the levels are impossible to complete. You’re also given the ability to control the different octopuses you save throughout the game with each one having their own unique ability, so that does give you a bit more of an advantage in some levels. 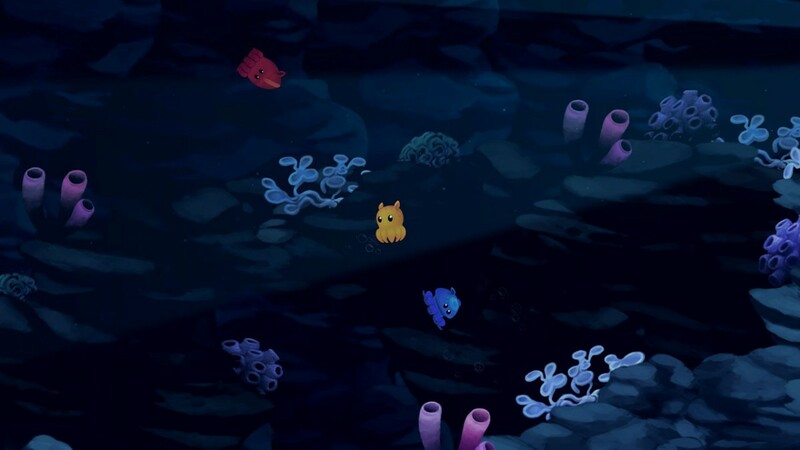 The little saviour for me was the blue octopus that was able to teleport from one spot to another; that little trick got me out of many deadly situations. Unfortunately the game isn’t just as simple as completing a level. In each level you’re tasked with finding three collectibles, each one hidden carefully or only available for a brief time as you race against the clock to collect it before it’s snapped away by an enemy. Whilst the collectibles add an extra dimension to the gameplay they can be very punishing to collect along the way. In some of the latter levels I found I wasn’t able to actually collect any of the collectibles without dying. Whilst this could be put down to my lack of skill at the game it was slightly frustrating, especially considering that you need to collect certain amounts of these collectibles in order to progress to the later stages. Of course though, that is what Airscape: The Fall Of Gravity prides itself on; it was designed with this difficulty in mind, so you can’t really hold it against the game. In fact, there weren’t many flaws with the actual gameplay. The camera could be slightly disorientating but this is easily remedied by the game allowing you to adjust the speed of the camera’s movement. There were one or two levels though where the frame rate of the game dropped for me, but that was hardly game breaking. The gameplay is enjoyable and has that ‘one more try’ feel to it – you’ll be hooked from start to finish, even if the difficulty does drive you insane at times. Simplicity is the key with the graphics of Airscape: The Fall Of Gravity. Gameplay takes place across a cute, cartoon-like 2D plane but manages to do nothing special. That’s not to say the game is ugly by any means though – just very simple. Colours are vibrant and there is a lot of charm with the character designs (I appreciate the little astronaut helmets on the octopuses). 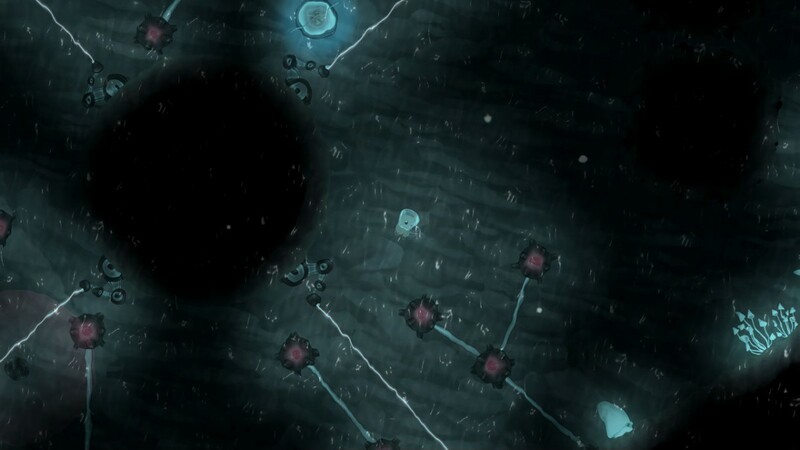 There are also some cool level designs too, some levels appearing in a silhouette style reminding me of classics such as ‘Limbo’. I have nothing bad to say about the game graphically – it’s just all a little simple, especially in comparison to a lot of other 2D platformers on the market these days that really push the boundaries in art design. The soundtrack of the game is pleasant, the music generally uplifting and fitting to the nature of the game. Some of the more dark levels have a more sombre tone to them, whereas other times the music will have a more epic feel to it as you make that vital jump whilst avoiding a homing missile, safely taking you to the next level. The composer did a good job – again though, in a similar vein to the graphics, the music does nothing that makes it really stand out against the crowd. It enjoyed it and it worked well within the game but there was nothing overly memorable to me. It took me roughly four hours, 3933 jumps and 986 deaths to complete the game (that last boss was a treat!) but despite the punishment I went through it was an enjoyable experience. Whilst the aesthetics aren’t exactly awe inspiring and you won’t find yourself whistling the game’s tunes for days after, you will be hooked in by its charm and addictive gameplay. 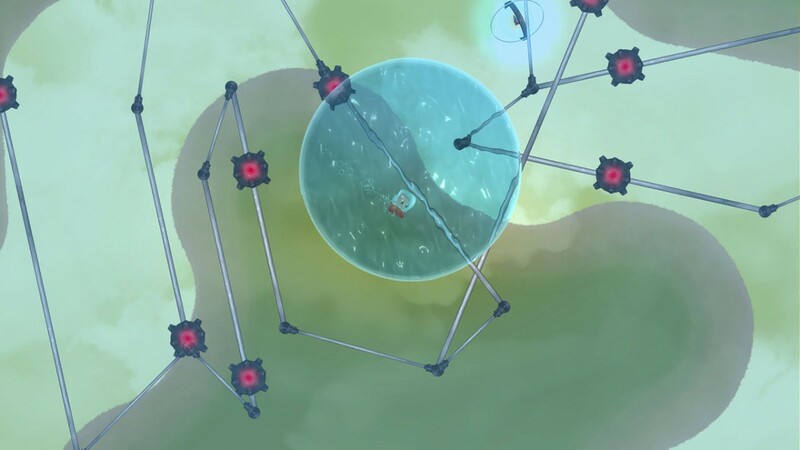 The small development team behind Airscape: The Fall Of Gravity deserve a lot of praise for the work they’ve done – they’ve managed to craft an enjoyable, pleasant game that will be a treat for physic-based platformer enthusiasts and for those who are gluttons for punishment.